My students enjoy this display because they had a hand in creating it. For the last two weeks of October, every time they read a book, they got to write down the title of the book and their name on a book diecut. I told them the diecuts were going to be used in a display, but I didn't tell them exactly how. I stressed that these should be books they read on their own, not books that they "had" to read for school or that anyone read to them. They loved getting to write on the diecuts and know it was going to be posted in the classroom; I loved that they read over 80 books during those two weeks! 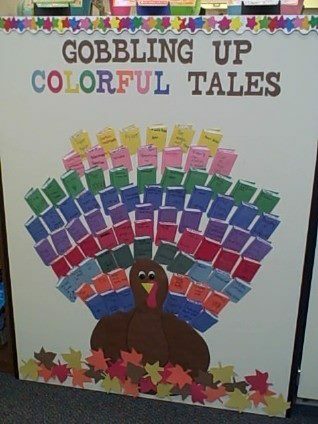 After Halloween, I put up the new display, with the books creating the tail of the turkey. The students were impressed and excited; even though it's been up for a few weeks now, they continue to come up and point out which books are theirs. I've even had several ask me if they can add another book to it now. Based on this positive reaction, this is definitely an idea I will reuse in the future!